Do you love performing stand-up comedy? Is it your passion? Do you wish you could do it full-time? Do you have a day job just to pay the bills? Would you like to learn how to quit your day job and have all the business skills necessary to go full-time with stand-up comedy? 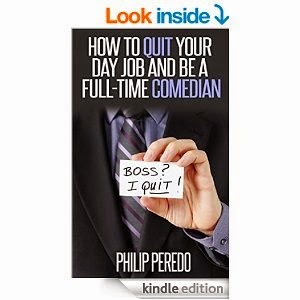 And if you're already doing comedy full-time but you're not making what you want to make or if you recently got laid off from your job - this e-book is for you too! What if you love your day job, but you love stand-up comedy too? Can you reconcile the two passions? Yes! We’ll show you how. Click HERE to get it now on Amazon!! !